Ben Nichols first joined the LMB’s Cell Biology Division in 1996, as a postdoctoral scientist in Hugh Pelham’s group, working on yeast genetics and biochemistry. He cloned the genes for two SNARE proteins (these are involved in membrane fusion events) and in collaboration with Bill Wickner’s group in the US, he showed that these SNAREs affected the in vitro fusion of vacuoles in a way that had been predicted by some, but had not previously been possible to demonstrate directly. Ben also made major contributions to the Division’s survey of SNAREs in the Golgi. In 1999 Ben moved to NICHD at Bethesda, USA, for further postdoctoral experience. Ben returned to LMB in 2001 as a Programme Leader Track, to set up a group working on endocytosis and the organisation of the plasma membrane. His lab studied the lateral organisation of proteins and lipids within the plasma membrane, and the relationship between this organisation and sorting into different endocytic pathways. The goal was to understand how lateral heterogeneity in both protein and lipid composition within membranes is generated and exploited to generate differentiated regions of membrane. This is important during membrane trafficking, where transport intermediates or vesicles with a different composition from the rest of the membrane must be generated, and on a larger distance scale during cell polarisation or establishment of functionally specialised cell surfaces. In 2006, Ben became a tenured Programme Leader. His group continued to study the mechanisms underlying several important aspects of plasma membrane cell biology: particularly, how regions of the membrane are specialised for different functions, and how proteins and lipids are internalised from the membrane. They focussed on the role of oligomeric protein assemblies that form specific microdomains. Caveolae, flask-shaped membrane invaginations formed by cavin and caveolin proteins, constitute one kind of microdomain, and flotillin proteins form another. The Group’s achievements over the years have included revealing functions for flotillin proteins in cell migration, determining key protein actors at the neck of caveolae, characterising the large 80S protein complex that generates the bulb of caveolae, and quantifying flux through different endocytic pathways in tissue culture cells. Studies in cultured cells and model organisms have been successful in identifying many molecular components and specific protein-protein interactions. 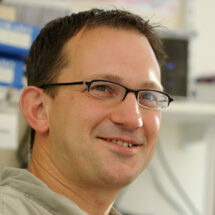 Ben was selected as an EMBO Young Investigator in 2004. In 2008 he was awarded the British Society for Cell Biology Hooke Medal, for his work on the cell biology of endocytosis. Ben left the LMB in January 2019, to pursue his life-long love of travelling. Caveolae protect endothelial cells from membrane rupture during increased cardiac output. Clathrin-independent pathways do not contribute significantly to endocytic flux. Exploring the caves: cavins, caveolins and caveolae. Trends Cell Biol 20: 177-186. Flotillin microdomains interact with the cortical cytoskeleton to control uropod formation and neutrophil recruitment. J Cell Biol 191: 771-781.